Australia’s world famous Whitehaven Beach is located on North Queensland’s Whitsunday Island. The majestic white sands are actually made up of tiny bits of coral from the Great Barrier Reef, after millions of years of being turned and crushed by the blue, gentle ocean waves. Since it’s located so close to Australia’s coast, the island is a popular day trip and easily accessible. The African island nation of Mauritius has so many beautiful beaches, it was impossible to pick just one. A coral reef surrounds the islands, making for some amazing snorkeling. You may also recall that the island was the only known home of the famously extinct Dodo bird, which met its demise shortly after European settlers discovered it. If Bali is known for anything, it’s the beaches. Lined with resorts and popular with tourists, Sanur Beach has a well deserved reputation of being one of the world’s most beautiful. The surf here is gentler than at other beaches on the island, and the surrounding beach town is mellow, laid back and exactly what you’d expect from paradise. Lounging under a palm tree here will quickly make you forget all your troubles. Located in the largest ecological reserve designated by the Mexican government, is the Bahias de Huatulco, which includes 35 km of coastline, 10 bays and 35 beaches. While many of the beaches are secluded, there is also a local infrastructure in place for travellers.. Because so many of the beaches are hard to reach, you’ll be able to cozy in to your own romantic nook far away from the ’spring break’ crowds and noise common in Mexico’s more populous beaches. In a land of beautiful beaches, Praia do Rosa is one of Brazil’s best. Nestled within a crescent-shaped bay, this beach has it all: sand dunes, surfing, beautiful people, charming bungalow getaways, and you can even catch a glimpse here of southern right whales making their seasonal migration, from July to November. Perhaps more famously known as “Shipwreck Beach” or “Smuggler’s Cove”, this breathtaking white-sands spot might symbolize the Greek Islands better than anywhere. The shipwreck is the suspected remains of the smuggler ship Panagiotis, which would be ghostly or ominous if we couldn’t imagine a better place to shipwreck. We know Antarctica isn’t exactly a continent known for its beaches, but you might be surprised. Most notable is Deception Island, which is actually a half-submerged, active volcano caldera. It may be hard to believe, but thanks to that volcano, it’s actually warm enough to swim in the island’s bay. Yes, even in Antarctica. The island also features several hot springs, like those featured above. Try swimming with the penguins– in a bathing suit! Hindus are currently observing one of our very and perhaps most sacred and auspicious festivals—Nava-raatri. In its literal sense, it is nine nights of worship, prayer, introspection and scriptural recommitment. Religious observances, traditional worship have, at times, more than one significance. Apart from them being the adoration of the Divine, they are commemorative of thrilling bygone events, allegoric when interpreted from the occult standpoint, and are significant pointers guiding man on the path of God-Realization. Nava-raatri is one such event. Outwardly, the nine days of worship are featured with wide performances of ritualistic worship. It is dedicated to worship of God as Mother—the feminine aspect in three prominent names, viz, Durgaa, Lakshmee and Saraswatee. However, underlying all outward engagements during this occasion, there must be a more sublime and profound inward transformation of life, that every spiritual aspirant seeks to undergo. This deeper purpose of Nava-raatri is captured in its division of three sets of three nights each, to which the spiritual aspirant in his life of spiritual pursuits adore the different aspects of the Supreme Goddess. This has got a very sublime, yet thoroughly practical, truth to reveal. In its cosmic aspect, it epitomizes the stages of the evolution of man into God, from manhood to Godhood. In its individual import, it shows the course that his spiritual pursuits should take. The central purpose of existence is to recognize your eternal identity with the Supreme Spirit. It is to grow into the image of the Divine. The Supreme One embodies the highest perfection. It is spotless purity, “Niranjana”. To recognize your identity with That, to attain union with That, is verily to grow into the very likeness of the Divine. The spiritual seeker has, therefore, as the initial step, to get rid of the countless impurities and the un-divine elements that have come to cling to him in his embodied state. This transformation is to be had during the first three nights (first segment of Nava-raatri), where the Supreme is worshipped as Mother Durgaa. Then he has to acquire lofty virtues and auspicious divine qualities. This happens in the second three nights of the season, wherein the Goddess as Lakshmee is adored. Thus purified and rendered full of purity and goodness, Knowledge flashes upon him like the brilliant rays of the sun upon the crystal waters of a perfectly calm lake. This is to be had in the final section of Nava-raatri in which Saraswatee is worshipped. This arrangement has also a special significance in the aspirant’s spiritual evolution. It marks the stages of evolution which are indispensable for every seeker of spirituality, through which everyone should pass. One naturally leads to the other, and to short-circuit this would inevitably result in a miserable failure. Nowadays, many ignorant spiritual seekers aim straight at the appropriation of Knowledge without the preliminaries of purification and acquisition of divine qualities, and complain that they are not progressing in the path. How can they? Knowledge will not descend till the impurities are washed out and purity is developed. The pure and good plant can grow on no impure soil. Therefore, Nava-raatri if observed as pointed out above brings man to realize his higher self and to feel the Supreme Spirit within— all of which helps in the journey of realizing the Ultimate Goal—to merge with the Supreme. There are two birds on the same tree. One is perched at the top and the other below. The bird which is sitting on the top is perfectly serene, silent and majestic at all times. It is ever blissful. The other bird, which is perching on the lower branches, eats the sweet and bitter fruits by turns. It dances in joy sometimes. It is miserable at other times. It rejoices now and weeps after some time. Sometimes it tastes an extremely bitter fruit and gets disgusted. It looks up and beholds the other wonderful bird with golden plumage which is ever blissful. It also wishes to become like the bird with golden plumage, but soon forgets everything. Again it begins to eat the sweet and bitter fruits. It eats another fruit that is exceedingly bitter and feels very miserable. It again tries to become like the upper bird. Gradually, it abandons eating the fruits, and becomes serene and blissful like the upper bird. The upper bird is God—the Supreme Spirit within. The lower bird is the individual who reaps the fruits of his deeds, viz., pleasure and pain. He gets knocks and blows in the battle of life. He rises up and again falls down as the senses drag him down. Gradually he develops dispassion and discrimination, turns his mind towards God, practices meditation, attains Self-realisation and enjoys the eternal bliss of God, which is the end goal of life. Nava-raatri must foster and help in meeting this end. In essence, Nava-raatri is a call for spiritual awakening. 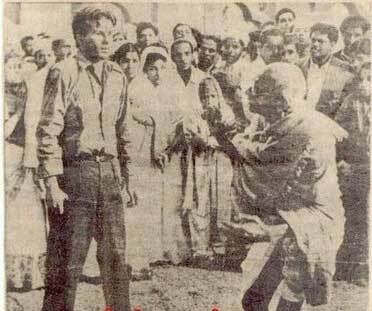 WHY I KILLED GANDHI – Nathuram Godse’s Final Address to the Court. In fact, honour, duty and love of one’s own kith and kin and country might often compel us to disregard non-violence and to use force. I could never conceive that an armed resistance to an aggression is unjust. I would consider it a religious and moral duty to resist and, if possible, to overpower such an enemy by use of force. [In the Ramayana] Rama killed Ravana in a tumultuous fight and relieved Sita.. [In the Mahabharata], Krishna killed Kansa to end his wickedness; and Arjuna had to fight and slay quite a number of his friends and relationsincluding the revered Bhishma because the latter was on the side of the aggressor. It is my firm belief that in dubbing Rama, Krishna and Arjuna as guilty of violence, the Mahatma betrayed a total ignorance of the springs of human action. Interesting – Why am I a Hindu ? A Hindu was flying from JFK New York Airport to SFO San Francisco Airport CA to attend a meeting at Monterey, CA. An American girl was sitting on the right side, near window seat. It indeed was a long journey – it would take nearly seven hours. Then suddenly the girl asked: ‘What’s your faith?’ ‘What?’ He didn’t understand the question. ‘No!’ He replied, ‘He am neither Christian nor Muslim’. Apparently she appeared shocked to listen to that. ‘Then who are you?’ “I am a Hindu”, He said. She looked at him as if she was seeing a caged animal. She could not understand what He was talking about. A common man in Europe or US knows about Christianity and Islam, as they are the leading religions of the world today. He explained to her – I am born to a Hindu father and Hindu mother. Therefore, I am a Hindu by birth. ‘Who is your prophet?’ she asked. ‘We don’t have a prophet,’ He replied. He thought for a moment. Muslims and Christians believe one God (Male God) who created the world and takes an interest in the humans who inhabit it. Her mind is conditioned with that kind of belief. According to her (or anybody who doesn’t know about Hinduism), a religion needs to have one Prophet, one Holy book and one God. The mind is so conditioned and rigidly narrowed down to such a notion that anything else is not acceptable. He understood her perception and concept about faith. You can’t compare Hinduism with any of the present leading religions where you have to believe in one concept of God. This sounded very crazy to her. She couldn’t imagine a religion so unorganized, still surviving for thousands of years, even after onslaught from foreign forces. What can He tell to this American girl? He said: ‘I do not go to Temple regularly. I do not make any regular rituals. I have learned some of the rituals in my younger days. I still enjoy doing it sometimes’. ‘Why should I? Even if I challenge some of the rituals and faith in Hinduism, nobody can convert me from Hinduism. Because, being a Hindu allows me to think independently and objectively, without conditioning. I remain as a Hindu never by force, but choice.’ He told her that Hinduism is not a religion, but a set of beliefs and practices. It is not a religion like Christianity or Islam because it is not founded by any one person or does not have an organized controlling body like the Church or the Order, I added. There is no institution or authority..
‘So, you don’t believe in God?’ she wanted everything in black and white. ‘We have a concept – abstract – not a personal god. The concept or notion of a personal God, hiding behind the clouds of secrecy, telling us irrational stories through few men whom he sends as messengers, demanding us to worship him or punish us, does not make sense. I don’t think that God is as silly as an autocratic emperor who wants others to respect him or fear him.’ He told her that such notions are just fancies of less educated human imagination and fallacies, adding that generally ethnic religious practitioners in Hinduism believe in personal Gods. The entry level Hinduism has over-whelming superstitions too. The philosophical side of Hinduism negates all superstitions. लोका समस्ता सुखिनो भवन्तु !!! ॐ शान्तिः शान्तिः शान्तिः !!! ‘Hmm ..very interesting. I want to learn more about this religion. It is so democratic, broad-minded and free’ she exclaimed. He told her – if you look for meaning in life, don’t look for it in religions; don’t go from one cult to another or from one Guru to the next. For a real seeker, He told her, the Bible itself gives guidelines when it says ‘ Kingdom of God is within you.’ I reminded her of Christ’s teaching about the love that we have for each other. That is where you can find the meaning of life. Loving each and every creation of the God is absolute and real. ‘Isavasyam idam sarvam’ Isam (the God) is present (inhabits) here everywhere – nothing exists separate from the God, because God is present everywhere. Respect every living being and non-living things as God. That’s what Hinduism teaches you. Hinduism is referred to as Sanathana Dharma, the eternal faith. It is based on the practice of Dharma, the code of life. The most important aspect of Hinduism is being truthful to oneself. Hinduism has no monopoly on ideas. It is open to all. Hindus believe in one God (not a personal one) expressed in different forms. For them, God is timeless and formless entity. Ancestors of today’s Hindus believe in eternal truths and cosmic laws and these truths are opened to anyone who seeks them. But there is a section of Hindus who are either superstitious or turned fanatic to make this an organized religion like others. The British coin the word ‘Hindu’ and considered it as a religion. He said “I am a Hindu primarily because it professes Non-violence – ‘Ahimsa Paramo Dharma’ means – Non violence is the highest duty. I am a Hindu because it doesn’t condition my mind with any faith system. A man/woman who changes his/her birth religion to another religion is a fake and does not value his/her morals, culture and values in life. Hinduism is the original rather a natural yet a logical and satisfying spiritual, personal and a scientific way of leaving a life..
Posted on October 2, 2013 Categories conversion, Culture, Hindu, religionLeave a comment on Interesting – Why am I a Hindu ? விநாயகர் அகவல் என்னும் நூல் ஔவைப் பிராட்டியாரால்அருளிச் செய்யப்பட்டது. இது தமிழ்ச் சைவர்களின் நித்திய பாராயண நூல்களில் ஒன்றாக விளங்குகின்றது. தமிழர்கள் கைக்கொண்டொழுகிய வழிபாட்டுநெறியோடு யோகநெறியையும் விளக்கியருளும் சிறப்பு வாய்ந்தது. இக்கருத்துக்கள் சைவசித்தாந்தப் பேராசிரியர் திரு இரா.வையாபுரியார் அவர்கள் விநாயகர் அகவலுக்கு எழுதியுள்ள பேருரையினின்றும் திரட்டப் பட்டது. ‘சொல்லிய பாட்டின் பொருளுணர்ந்து சொல்லுவார் செல்வர், சிவபுரத்திலுள்ளார்’. விநாயகர் அகவலைப் பாராயணம் செய்யும்போது இப்பொருள்கள் நினைவுக்கு வந்து பாராயணத்தைப் பயனுடையதாக்கும். இந்நூல் 15ஆவது வரி ‘அற்புதம் நின்ற கற்பகக் களிறே’ என்று கூறுவதால் இந்நூலில் கூறப்படும் விநாயகப் பெருமானின் திரு நாமம் ‘கற்பக விநாயகர்’ என்பது. இது அவருடைய சொரூப நிலை அல்லது உண்மை நிலை எனப்படும். இது பரசிவமாக இருக்கும் நிலை. • தாமரை மலர்போன்ற மென்மையும் அழகும் மலர்ச்சியும் உடைய திருவடிகள். • அத்திருவடிகளில் இனிய ஒலியெழுப்பும் சிலம்பு. • பேழை (பெட்டி) போன்ற வயிறு. • பெரிய வலிமை மிக்க தந்தம். • அங்குசம், பாசம் என்னும் ஆயுதங்கள். • கன்னத்தில் மதநீர் வடிந்த சுவடு. இது குணங்குறி அற்ற பரசிவம் உயிர்களுக்கு அருளும் பொருட்டு மேற்கொள்ளும் வடிவங்களுள் ஒன்று. அதனால் தடத்த வடிவம் அல்லது தடத்த நிலை எனப்படும். இறைவடிவங்களைத் தரிசித்துத் தொழும்போது திருவடியிலிருந்து தொடங்கி உச்சிவரைக் கண்டு திருமேனியில் விழியைப் பதித்தல் முறை. திருவடி என்பது திருவருள். திருவருளால் இக்காட்சி நடைபெறுகின்றது என்பது பொருள். • அவருக்கு நிவேதனப் பொருள்கள் முப்பழம். • அவர் தன்னை வழிபடும் அடியவர்களுக்குத் தாய்போன்ற அன்புடையவர். • எப்பொழுதும் அடியவர்களைப் பிரியாமல், அவர்களுடைய அறிவுக்கு அறிவாய், அறிவினுள்ளே இருந்து அவர்களுக்கு வாழ்வில் வழிகாட்டுவார். • அடியவர்களுக்குப் பக்குவம் வந்த காலத்தில் குருவடிவாக வெளிப்பட்டு வந்து, முன் நின்று தீக்கை செய்து உண்மை ஞானம் புகட்டுவார். • அடியவர்களை யோகநெறியிலும் ஞானநெறியிலும் நிற்கச் செய்வார். • நின்மல அவத்தை (அருளுடன் கூடிநிற்கும் நிலை) யில் நிற்கச் செய்வார். • அளவில்லாத ஆனந்த அனுபவம் விரியச் செய்வார். • இறுதியில் தன்னைப்போலத் தன் அடியவர்களையும் என்றும் மாறாத அழியாத நிலையில் (தத்துவநிலை) நிற்கச் செய்வார். • இதுவரையிலும் அவ்வுயிர் செத்துப் பிறந்து உழல்வதற்குக் காரணமான மயக்க அறிவைப் போக்குகின்றார். • திருவைந்தெழுத்தை (‚ பஞ்சாக்கரம்) நெஞ்சில் பதிவிக்கின்றார். • உள்ளத்தில் வெளிப்பட்டு விளங்கி நிற்கின்றார். • பதி, பசு, பாசம் எனும் அனாதியான முப்பொருள்களின் இயல்பினை விளக்கி உரைக்கின்றார். சஞ்சிதம் எனும் பழவினையைப் போக்குகின்றார். ஞானோபதேசம் செய்கின்றார். • உபதேசித்த ஞானப்பொருளில் ஐயம், திரிபு ஆகியன நேரிடாமல் தெளிந்த உணர்வு உண்டாமாறு அருளுகின்றார். • ஐம்புலன்கள் விடயங்களை நோக்கி ஓடி விருப்பு வெறுப்புக் கொண்டு துன்புறாதபடி புலனடக்கம் உண்டாவதற்குரிய வழியினைக் காட்டியருளுகின்றார். • உடம்பில் உள்ள தத்துவக் கருவிகள் எவ்வாறு ஒடுங்குகின்றன என்பதை அறிவிக்கின்றார். • பிராரத்த வினை தாக்காதவாறு காப்பாற்றுகின்றார். • ஆணவம லத்தால் வரும் துன்பத்தைப் போக்குகின்றார். • ஆன்மாவை நின்மல நிலைக்கு உயர்த்தி நின்மலதுரியம் நின்மலதுரியாதீதம் என்னும் நிலைகளில் திருவருளுடனும் சிவத்துடனும் கலந்து நிற்கச் செய்கின்றார். குருவாக வந்த விநாயகப் பெருமான் இவ்வாறு ஞானநெறியை அருளி, இந்த ஞானநெறியில் நெகிழ்ந்து விடாது உறுதியாய் நிற்பதற்குரிய யோகநெறியினையும் அறிவித்தருளுகின்றார். • ஒன்பது வாயில்களை உடைய உடம்பில் உள்ள ஐம்புலன்கள் ஆகிய கதவுகளை அடைத்து மனம் உள்ளே (அகமுகப்பட்டு) நிற்கச் செய்கிறார். • இதனால் ஆதாரயோகம் மேற்கொள்ளும் முறையினைத் தெளிவிக்கின்றார். • மவுனசமாதி நிலையினை அடையச் செய்கின்றார். • இடநாடி, வலநாடி, சுழுமுனா நாடி என்னும் நாடிகளின் வழியாய் மூச்சுக்காற்று இயங்கும் முறையினைத் தெரிவிக்கின்றார். • சுழுமுனா நாடி மூலாதாரத்திலிருந்து கபாலம் வரையிலும் (தலையுச்சி) சென்று நிற்கும் நிலையினைத் தெரிவிக்கின்றார். • அவ்வாறு செல்லும் வழியில் உள்ள அக்கினி மண்டலம், சூரிய மண்டலம், சந்திர மண்டலம் என்னும் பகுதிகளின் இயல்பைத் தெரிவிக்கின்றார். • மூலாதாரத்தில் உள்ள ஹம்ச மந்திரம், குண்டலினி சத்தி, பிரணவ மந்திரம் என்பனவற்றின் இயல்பினைத் தெரிவிக்கின்றார். • இடகலை, பிங்கலை என்னும் மூச்சுக்காற்ரினால் குண்டலினி என்னும் சத்தியை எழுப்பிச் சுழுமுனைநாடி வழியாக மேலே கபாலம் வரையிலும் பிரணவமந்திரத்துடன் ஏற்றும் முறையினையும் தெரிவிக்கின்றார். • இவ்வகையில் பிரணவமந்திரம் பலகலைக்களாகப் பிரிக்கப்பட்டு, (மூன்று, ஐந்து, பன்னிரண்டு, பதினாறு) உடம்பில் அங்கங்கே நிறுத்தித் தியானிக்கப்படுவதாகிய பிராசாத யோகம் என்னும் நெறியினையும் கற்பிக்கின்றார். • இப்பிராசாத யோகத்தினால் ஆன்மா பிரமரந்திரம் (தலையுச்சி) என்னும் இடத்தையும் கடந்து மேலே துவாதசாந்தப் பெருவெளி என்னும் இடம்வரையிலும் சென்று சிவத்துடன் கலந்து நின்று சிவானந்தம் அனுபவிக்கச் செய்கின்றார். • இவ்வாறு ஆறாதார யோகம், அட்டாங்க யோகம், பிராசாத யோகம் என்னும் முறைகளில் நிற்கச் செய்து மனோலயம் அடையச் செய்கின்றார். • இதனால் உண்டாகும் அகக் காட்சியினால் ஆன்மாவின் இயல்பு, உடம்பின் இயல்பு, மாயாமலம் கன்மமலம் ஆணவமலம் என்பனவற்றின் உண்மையியல்பு ஆகியவற்றை அறிய வைக்கின்றார். • சப்தப்பிரபஞ்சம் (ஒலியுலகம்) அர்த்தப்பிரபஞ்சம்(பொருளுலகம்) என்பனவற்றினியல்பையும் அவற்றில் பரம்பொருள் சிவலிங்கரூபமாகக் கலந்திருக்கும் முறையினையும் அறியச் செய்கிறார். • இத்தகைய பரம்பொருள் மிகச் சிறிய பொருள்களுக்கெல்லாம் மிகச் சிறியதாகவும், மிகப் பெரிய பொருள்களுக்கெல்லாம் மிகப் பெரிய பொருளாகவும் இருக்கும் நிலையை உணரச் செய்கின்றார். • இத்தகைய பரம்பொருள்சை உலகவாழ்வில் இருந்துகொண்டே அறிவதும் அப்பொருளுடன் கலந்து ஆனந்தம் அனுபவிப்பதும் கரும்பினைக் கணுக்கணுவாகச் சுவைத்துச் செல்லும் அனுபவம் போன்றது. • இந்த அனுபவம் நீடித்திருக்கத் திருநீறு உருத்திராக்கம் முதலிய சிவசின்னங்களை அணிய வேண்டும். • அவற்றையும் அவற்றை அணிந்துள்ள அடியார்களையும் சிவமெனவே கண்டு வழிபடுதல் வேண்டும். • எப்பொழுதும் அடியார் கூட்டத்துடன் கலந்திருத்தல் வேண்டும். • திருவைந்தெழுத்து மந்திர செபத்தைக் கைவிடலாகாது. இவ்வாறு விநாயகப் பெருமான் பக்குவமுடைய ஆன்மாவுக்கு ஞானோபதேசம் செய்து ஞானநெறியிலும் யோகநெறியிலும் நிற்கச் செய்து இவ்வுலகிலேயே சீவன்முத்தனாக இருந்து சிவானந்தம் அனுபவிக்கும் நிலையினையும் தந்து, அவ்வான்மா சிவத்தைப் போலென்றும் ஒரேதன்மையுடையதாய் இருக்கும் நிலையினை அடையச் செய்கிறார். அந்நிலையிலிருந்து அவ்வான்மா தன்னைவிட்டு நீங்காமல் தனக்கே அடிமையாய் இருக்கும் நிலைமையினையும் விநாயப் பெருமான் அருளுகின்றார் என்னும் அரிய செய்திகளை விநாயகர் அகவல் என்னும் இந்த நூல் கூறுகின்றார். ஒளவையார் அருளிய விநாயகர் அகவல் (மூலமும் உரையும்): அட்டாங்கயோகம், பிராசாத யோகம். ஒரு கோவில் மண்டபத்தில் ஆன்மீகச் சொற்பொழிவாற்றிக் கொண்டிருந்த துறவியின் பேச்சுப் பிடிக்காமல், ஒருவன் ஒரு கல்லை அவர்மீது வீசினான், அக்கல் துறவியின் தலையில் பட்டுக் காயத்தை ஏற்படுத்தியது. துறவியின் துன்பத்தைக் கண்ட மற்ற பக்தர்கள், எழுந்து ஓடி, அந்த இளைஞனைப் பிடித்துத் தாக்கத் துவங்கினர். அதைக் கண்ட துறவி, அவனை அடிக்க வேண்டாம், அவனைத் தன்னிடம் அழைத்து வருமாறும் சைகை செய்தார். துறவி கூறியதைக் கேட்டவுடன் அவர் பாதங்களில் தடால் என்று விழுந்து அழுதான் அந்த இளைஞன். இன்னா செய்தவரைத் தண்டித்தல் அவரே நாணும் படியாக அவருக்கு நல்லுதவி செய்து அவருடைய தீமையையும் நன்மையையும் மறந்து விடுதலாகும். Thus shame their souls; but pass the ill unheeded by. The (proper) punishment to those who have done evil (to you), is to put them to shame by showing them kindness, in return and to forget both the evil and the good done on both sides. Starting from our birth they have taken care of our food ( years * 365 days * 3 times = 24000 times! ), our clothes (daily washing, ironing, new purchasing), our education (daily home works, uniform, school/tuition fee), religious moral teaching every day (THE REAL GREAT JOB), computer toys purchasing and God knows how many other countless efforts they have put in to make us a complete human being�to survive in this world. Indeed, all those efforts�cannot be covered in this article but the overall emphasis is that its our moral and�religious�mandatory responsibility�to take care of them now. Give them enough money so that they don’t have to ask you. Share funny and entertaining things with them to make them laugh or smile. Don’t speak loudly. Speak slowly, nicely�and softly. Do not walk in front of them in market or anywhere. They might walk slow being old; stay behind them. Give them respect. Closely monitor thier health. visit doctor if required. Have them thorougly checked time to time. Take care of their medicines. Set reminders on your phone for their medicines and�serve them on time. Take them to the mosque. Walk slowly. Follow their pace. Take them to the park�for walk. If not possible daily, then take them on weekend. Do not call them by their name. Call them with respect. Adapt yourself according to�their�schedule not vise versa. Do shopping for them (buy their clothes, shoes, small items like tooth paste).� Buy your mother a nice coffee cup. Take them to market and buy them according to their likings. Buy your parents some nice books; usually people love to read books in old age. When you come back to home, visit them first in their room. In case of conflict on any issue, try to follow them as much as possible. Remember, they have been sacrificing their money and time in raising you for years and years. Its time to pay back. They have been showing all the patience during your childhood. Its time for you to be patient. Keep them with you instead of sending them�to old houses etc. This will be a big act of ignorance if you do. When starting the food, serve them first.